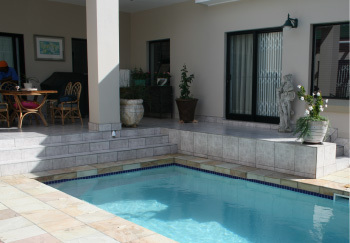 PELICAN POOLS was established in 1970 by Mr. Paul Botha. He has been building and installing swimming pools ever since. Today we have established ourselves as one of the largest and most reputable manufacturers of custom-designed in-ground concrete residential and commercial swimming pools in the Eastern Cape, with over 30 years experience within the pool industry. Our expertise covers the full range of pool design and installation. Pelican pools has achieved the prestige of being the premier designer and installer of swimming pools in the Eastern Cape with the finest quality installation techniques and equipment available, we have earned a reputation synonymous with quality and integrity this reputation should give you the confidence in going forward with your decision to build a Pelican swimming pool. This wealth of knowledge is available as a resource to all our customers. We cater for the discerning buyer who invests wisely and wants value for his money. We have the financial strength and capacity to give homeowners peace of mind in knowing that their installer will still be in business if their pool needs maintenance or modernization. Invest in a swimming pool and you have a constant source of leisure and pleasure right on your doorstep. A pool as an investment will not only increase the value of your home considerably, it will save you money, as there is no more cost of travel to beeches, over crowded public swimming pools and leisure centres. Invest in your health; swimming is one of the most popular sports and one of the healthiest forms of exercise. We take pride in the fact that today most of our work is from recommendations from our many satisfied customers. At Pelican Pools we promise to build you a pool to the highest standards with the minimum possible inconvenience, at a competitive price. We have established long term client relationships with over 2,500 proud pelican Pool owners. Our customers also exhibit a great degree of loyalty by contacting us to build not only their second pool, but also, in some cases, their third and fourth.